There have been rumors on twitter that another video blog from director Peter Jackson on the set of The Hobbit is due anytime. Well I’m not sure how much stock to put in that, but I know that he will post something sooner or later! 😀 That’s a pretty safe bet, LOL. Today’s animated gif request comes from jazzbaby1 who asked for clips of Richard Armitage rehearsing in the 3rd Hobbit production video from a few months ago. Jazzbaby1 is a fellow blogger who writes about music, poetry and movies. Here’s the link if you would like to visit her: FunkyBlueDandelion. This entry was posted in Animated GIFs, Graphics and tagged animated gifs, peter jackson, richard armitage, richardarmitagenet, richardarmitagenet.com, richardarmitagenetdotcom, the hobbit, thorin oakenshield. Bookmark the permalink. Sighhhhh! I’m waiting to meet up with my gal pals for the NYC premiere. Now I just have to save up for it. Ha!. @Gratiana: Oh I do hope you can make the premiere in New York City. Of course, there’s no guarantee that Richard Armitage will be there. He might be off filming in Antarctica, LOL! @April: Thank you so much for your lovely comment! Yes, the “grunge” reference was very clever of jazzbaby1! Whoa! Looks NOTHING like him! Can’t wait! @Twitterpatedss7: He looks incredible either way, but I bet the Thorin costuming and everything are very time-consuming to put on and heavy to wear around. @Thaís: It’s a long wait till December 2012…*sigh* I wonder what we can do to keep occupied? Ooh that short hair is so appealing to me! Very masculine, yum. The Hobbit is opening December 14, 2012 here in Canada – can’t wait! We know who is underneath the grunge and we love him regardless. I can’t believe there are only 3 gif days left in October……sob…..
I’m going to Wellington for the premiere if it kills me! Saving already. I don’t think the pinkness of Richard’s skin is simply sunburn……after all, June/July is winter in the Southern Hemisphere. It’s either an allergy to the heavy makeup/prosthetics or windburn/sunburn from the snow fields if he managed to get in some skiing. Like this gif very much. I would like to attend the world premiere, but New-Zealand is too far from Switzerland, just to watch a movie, LOL. Luckily I’m just a few hours across the Tasman (Sea, which separates Australia and New Zealand)!!! I have no idea as yet! But November is late Spring, so hopefully I won’t have to pack too many winter woolies. BTW… do Americans not distinguish between “to” and “too”? I’ve noticed quite a few instances lately on blogs and even titles of fanvids where “too” should have been used instead of “to”. One that springs instantly to mind is the fanvid entitled “To good to be true” (about Richard, of course) – I always want to get in there and correct it! @kahtryngaul: Oh the “too” and “to” debacle! I definitely know the difference, although I’m sure I’ve made a mistake stemming from a typo rather than a lack of knowledge. Sometimes I think it’s due to someone speaking English as a second language but I think it’s often due to ignorance or lack of diligence. I have been tempted to proofread and correct the Internet sometimes, LOL! And who knows if Richard will make it back to Wellington for the premiere anyway? I hope he does but I’m not really counting on it. I want to go there because that’s where the movies are being made – I want to support the New Zealand film industry. But, yes, I think I’m lucky to live in Australia as our relaxed way of life suits me down to the ground. However, I do like visiting other countries as well and loved Geneva – it reminded me a lot of Canberra. We have lakes (man-made) and a fountain in Lake Burley Griffin similar to the one in Geneva; our population is only about 400,000 and it’s a clean city. I like to think of it as having most of the advantages of a big city… without the accompanying disadvantages, such as traffic problems and pollution. If there’s anything we don’t have here, Sydney is only about 3 1/2 hours’ drive or a 45 minute flight away. I loved the way he moved in the production video and now it is captured in a gif. Bravo Bcc Mee and Jazzbaby1! @Kathleen: The man is a master of movement! I also love the way he shouts his lines and really “sells it” even in rehearsals. Too bad we can’t hear sound in an animated gif. Oh, heck, I hope you didn’t think that I think I’m perfect – far from it! I make mistakes all the time and I know it. It was actually a genuine enquiry as I was curious, that’s all. I’m the proverbial sticky-beak…..uh….nosey parker when it comes to other countries’ customs and traditions, etc. As you say, most mistakes are slip-ups and they probably come about because we’re rushing to get our thoughts out there as quickly as possible! @kathryngaul: I never took offense at what you said. The misuse of words is a bit of a pet peeve of mine but it seems that since the Internet doesn’t have proofreaders and editors that all our mistakes and poor grammar and spelling are out there for the world to see, LOL! Wow! That’s awesome and I am indeed surprised, bccmee! Thanks so much! that was so funny…I kept thinking Thorin was going to show up at the end of the row of ‘hairy men’…Do you think they would appreciate a makeover at our fav salon in ye olde town of Nottie??? Salon???!!!! That’s not manly! Bite yer tongue, lol! @jules: I used to tune into Almost Live on Seattle TV most every Saturday. It was a really humorous show that made fun of Seattle and its suburbs. I might have to watch some more of these YouTube videos! It’s not on the air anymore, but it would be brilliant if Richard Armitage showed up and did a cameo appearance in the “Lame List.” I would totally pass out! Thanks so much for your brilliant selection of video and caption! You are NOT lame, LOL! “Bill Nye the Science Guy” was terrific! Being in SW BC, Canada, Seattle’s KCTS9 is our “local” PBS station and he used to be on there. So true Teuchter – his voice…swoon no mistaking it. Simply cant wait to hear Thorin’s booming voice and to appear larger than life in 3D…….watch out floor! The eyes – well that’s a whole different fantasy! You got me wondering about the t-shirt RA is wearing in the production video, so I went and studied some Strike Back screencaps at RichardArmitageNet.Com. Looks like the same shade of gray and shape of v-neck, but the material is different. I do agree that John Porter looked amazing in that outfit. The only part I didn’t like was the back of the jeans. It looked like he sat in white paint, LOL! 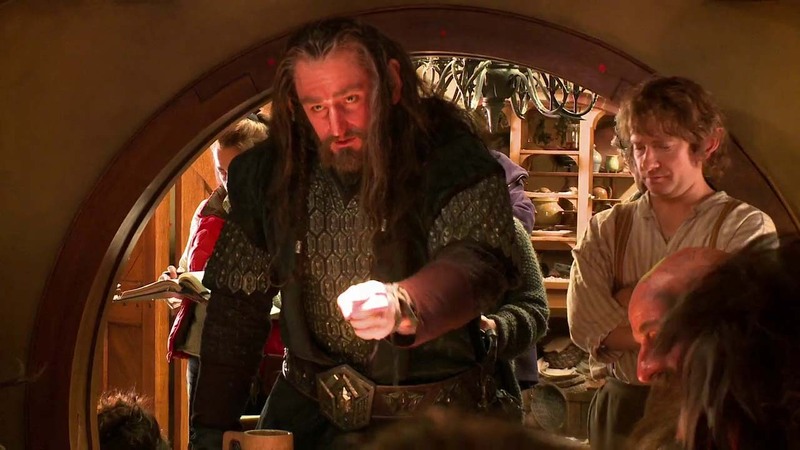 @mersguy: Even though Thorin is a dwarf, he’ll be larger than life on the movie screen. Thorin’s eyes will be as big as my head, LOL! I like to think of it as samurai hair, Jazzy. That works for me. Love your choice of gif. What, I have to “support” things I say here? Gee you make me work! LOL, beengizzied, when the first pictures came out with Thorin in the background I called him Warf’s Samurai Half-Brother. bccmee, jazzbaby, love this one! There’s a bit of Gisborne in the expression and the motion – but it is not Gisborne. So well captured, bccmee! @fitzg: Thanks! Thorin, god of grunge truly was an inspired choice by jazzbaby1! He looks so incredible in these rehearsal scenes. I’m not sure when the premiere in London will be held although I’m sure there will be plenty of advance notice! So you don’t need to buy any “water wings” for the swim, LOL! @Pamela: He will be a standout performer in the movie, I’m sure. 🙂 It is my hope that this role will give him great notice and he’ll be a busy man in movies for years to come. Thank you for choosing Thorin. He is haunting me, quite frequently. Yes, he has the look and the fierceness of a rock-star! I’ve just watched Gordon Macrae sing in the movie version of “Oklahoma” on YouTube again – he was such a great singer. Maybe Richard sings more like Gordon Macrae and Howard Keel than Hugh Jackman (as I mentioned elsewhere)??? Thorin can come to defend me any time ;o) Thank you, Jazzbaby1 and Bccmee for this wonderful gif. This one holds a special place together with the Lucas North one where he boxes down his opponent, as it is not just wonderful to watch, but also very effective medicine against agression ;o) Imagining, that my opponents meet either Lucas North or Thorin just makes me smile and all the problems suddenly seem much lighter. @CDoart: Richard Armitage said in an interview, “I’m not particularly alpha. ‘Nourish and nurture’ are my watchwords as opposed to ‘search and destroy’.” And yet he plays aggression so well! @Teuchter: Yes, he somehow seems so gentle and then he plays hideously evil characters extremely well, LOL! Thanks Bccmee and Jazzbaby1 for the masterful Thorin. Hope we get anothe VBlog soon. Well, if I win the lottery between now and next November, I’m off to NZ for the premiere- Ha! Otherwise definitely NYC ….or even LA on the red-eye! @Musa/Fabo: I’m very excited about a role where we finally get to hear Richard Armitage sing! Oh I know he sang in the Clarissa radio drama, but that was intentionally over-the-top. Nonetheless, it demonstrated that he can carry a tune! And if you come to the NYC premiere, perhaps we’ll all meet up. 🙂 I have no idea if Richard Armitage will be there, but hopefully we’ll know in time for those who have to make travel plans. I just need to jump on the subway, LOL! I think I’ll have to settle for the London premiere, but at least that will be in Armitage home territory!! @Kaprekar: I do wonder how and when it’s decided on the premiere locales and also who will be in attendance. I sure hope there’s a big movie celebration in London, especially since the cast is predominantly British! Guh. That is all I can say at this moment. Okay; a bit recovered now. Mmmmm…Thorin. 🙂 Love the “I Am Dwarf! Hear Me Roar! !” bit. Great job on the gif, bcc. Brilliant choice, Jazzy!! Thanks, you two! @Dhana: He is rather breathtaking, making it difficult to speak, LOL! Thanks for your comments! Thank your for another great gif bccmee and also jazzbaby1 of course. As for the Hobbit premiere neither NZ nor New York nor London will be an option for me. Like Ania I will happy if I find an opportunity to watch the original version of the Hobbit as all movies, especially those of the blockbuster variety are dubbed in Germany. One thing is for sure watching RA speaking in a German voice is just not on…. @Suse: I wish you luck in your quest to find a movie theater that will show The Hobbit in English! Perhaps Richard Armitage should have a clause in his contract that his voice is a treasure and cannot be dubbed, LOL! This sprang to mind when I read GOD OF GRUNGE (sorry, might be a bit tangential lol) … There is kind of a “grunge” link to another RA character. In Between the Sheets Paul wears an Oasis t-shirt at the bbq … and Noel Gallagher of Oasis (I believe) was a grunge fan and (being an Oasis fan myself, and a Noel Gallagher fan – he could be my working class bit of rough and write me some songs) I can feel the connection. Although Gallagher’s songs are largely more optomistic I think. Oh yes …. also love the Thorin does samurai look in the “roar” clip … GUH, GUH GUH. Nice on so many levels bccmee. @jazz: Haha, that’s a good point about “mood music.” I’m sure studies have been done on the effect of certain genres on the psyche. Sometimes when I’m in the supermarket I feel like fleeing though. I would have thought the intent of the background music was to get customers to stay longer, LOL! @beengizzied: Oh that’s an interesting connection! It seems there is a weave between many of Richard Armitage’s characters if you look ‘ard enough. 😉 I’ll have to revisit some of Noel Gallagher’s songs. Thanks so much for your thought-provoking comment! Noel Gallagher was on “Jonathan Ross Show” last night – but it was a repeat so not sure just when it was recorded. @kathryngaul: Is Jonathan Ross still on the air? I thought he was fired for playing a practical joke on a celebrity or something. Richard’s portrayal of Thorin will be amazing, can’t wait until the premiere of The Hobbit in Wellington, New Zealand in 2012. Yes I will be going, dubbed “Operation Squee-RAgism” is in full swing. I think poor Richard may have a bit of an allergic reaction to the prosthesis they used on his nose, Thorin’s nose is a different shape. I like the “grunge” reference far better than the “klingon” one! I year to go, it’s going to be a long wait! @mersguy: I certainly hope you keep us posted on your antics at the big premiere! LOL re: “Operation Squee-RAgism”! What are you going to wear? Certainly will B, now what to wear??? something to be thinking about might need to have my runners on. Pre season “Hobbit” training starts from today!! Sir Peter Jackson’s 50th birthday is on Monday 31, wondering if he might post new TH video on that day? @mersguy: I didn’t realize Sir Peter Jackson’s birthday was on Halloween! Oh my gosh, how lovely it would be if he gave us a gift in the form of a new production video! I wonder how he’ll celebrate? By the way, what does pre-season Hobbit training involve? Some short sprint work might be in order, exactly how long is the red carpet? Are you somewhere in the southern Hemisphere, too? Well, there you go! A typo. I meant “Southern Hemisphere”, of course. Sure am – Perth, Western AustRAlia! So you understand my eagerness to get to NZ, at last RA is in my (our) neck of the woods! Your from the Sydney or Melb?? Perhaps we can meet up at some stage? Just got back from the travel agents loaded with NZ info!!! My, you ARE eager! I’m in Canberra but would need to fly out of Sydney or Melbourne for NZ. You gals are totally crackin’ me up! I’m thinking the NYC premiere for me. You see, I have this really good friend who lives there…or not. Either way, I canNOT wait to see this movie! Seriously. I may be one of those nuts that camps outside the movie theater. @NovemberBride: Oh indeed you should come! Maybe I’ll visit you just prior and we can make the trek together, LOL! We were having repeats of the “Jonathan Ross Show” and that was the last episode. I’m of the even older school – I wouldn’t use spellcheck if you paid me! I didn’t even know that there’s such a thing as a grammar checker on computer! All my work colleagues brought their letters, reports, etc. to me to check the spelling, grammar and punctuation before the items were mailed out. Of course, that had the affect of lessening my own output slightly. It’s extremely difficult for me to turn “the editor” off and let creativity flow! One day, you’ll have to teach me how to do that. I used to write poems and stories when I was young but that was over a century ago! Ohhh! I can’t wait for Thorin! Thank you Bccmee and jazzbaby:) and correct me please..or wait..better not ..it will takes you so much time. For me Your spare time is priceless! @Joanna: Thank you so very much for all your support and kind comments! I understand you perfectly. 🙂 Prior to jazzbaby1 and beengizzied’s input, I had not noticed the similarity between Thorin and the grunge & samurai looks, but I see it clearly now! 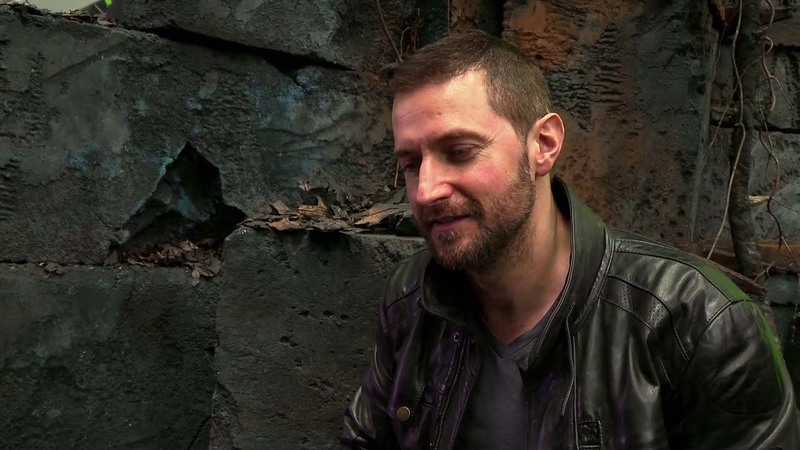 It’s going to be great to see Richard as Thorin. I hope they have a premier in Calif., TOO. I cannot wait for this movie and it’s amazing how makeup can create a whole different person.